We here at LezWatch.TV are pretty tuned into the tropes that TV dishes out. But there’s one type of show that has more than their fair share of wild and out there tropes. Telenovelas. Accidentally married your long lost twin brother? You’re on a telenovela! Fell into a coma for three years, woke up and left your husband for his niece? Telenovela! And our most favourite telenovela of them all is Jane the Virgin. To celebrate their fifth and final season, which starts in one week, we have created Jane the Virgin Bingo for you! It’s a beautiful free space with Rogelio. Download the PDF, print it up, and play Jane the Virgin Bingo with your friends. Or go for the grand poobah of them all and see if you can win on all the boards by the time the season is over. 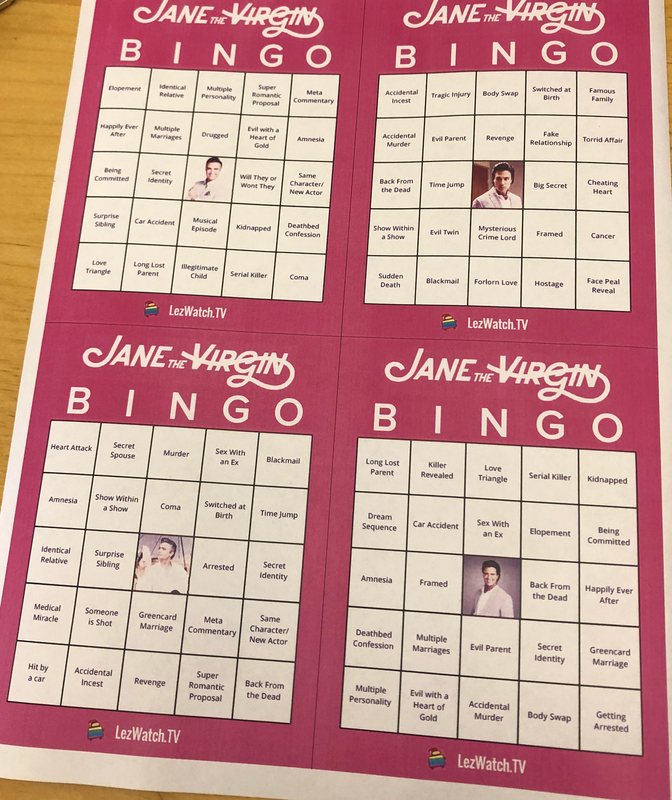 Post your winning boards to Twitter using #JaneTheVirginBingo and we’ll send you some swag! Jane the Virgin returns to our screens for the final season on March 27, 2019.